When I saw these on a facebook post from The View from Great Island, I knew immediately that I wanted to try making them. 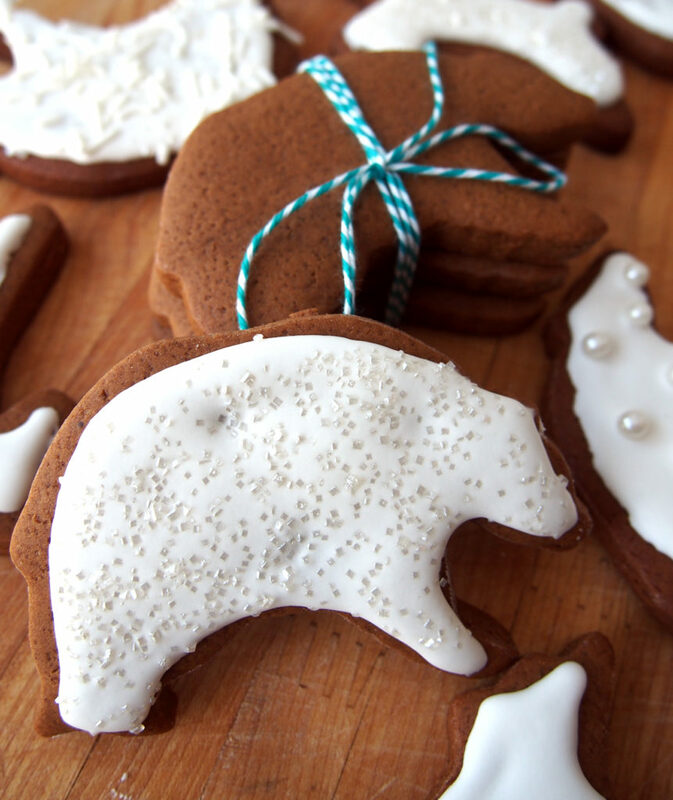 I adored the idea of polar bear cookies! These were my first gingerbread cookies (the traditional snappy type vs. a soft ginger cookie) and my first attempt at a flooding-style royal icing. I thought they turned out really well. 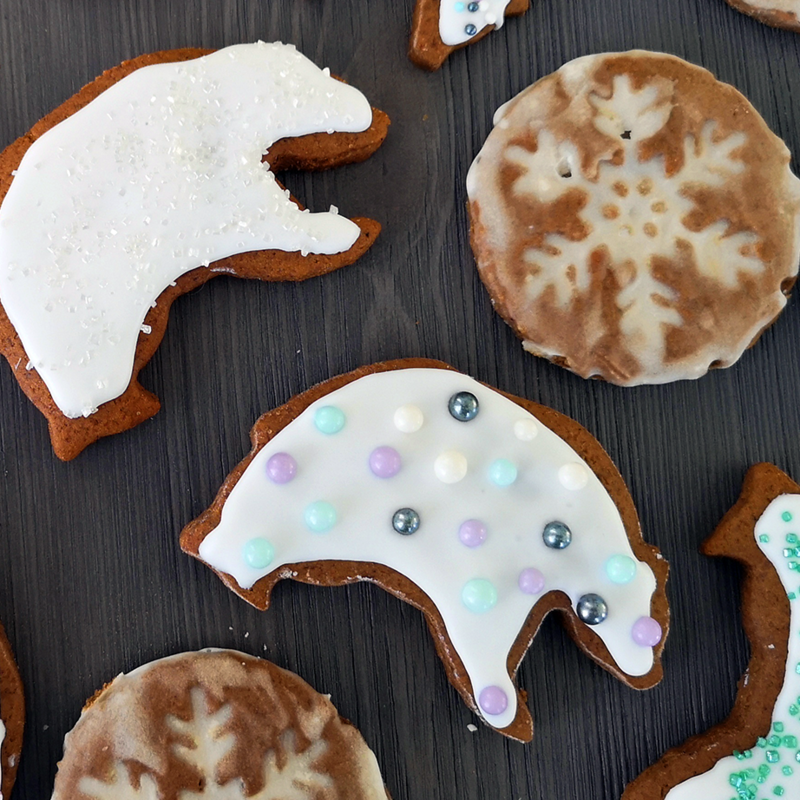 I wasn’t able to get an actual polar bear cutter, but figured that white icing on a standard bear shape would work just fine. The only issue I had with the cookie was the fault of my oven, as it’s gone on the fritz and would not keep a consistent temperature. But, as mentioned in the original post, the dough is great to work with. The royal icing was a bit of an adventure, as it took some time to get it to a consistency that would pipe nicely. Specially being the first time I’ve tried to make and decorate with it. But it only takes a bit of tweaking until it’s good to go, and the end result is actually the perfect touch of sweetness to the cookie, which on it’s own is not that sweet. 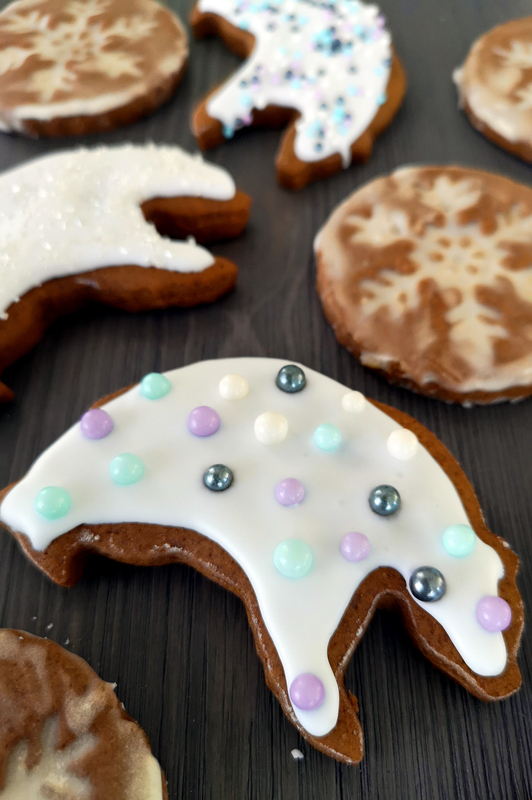 The dough really is easy to work with and the gingerbread men type of cookie is quite popular at Christmas. It’s just the icing that is daunting, for me anyways. I suppose it just takes practice to get a steady and invariable outline. 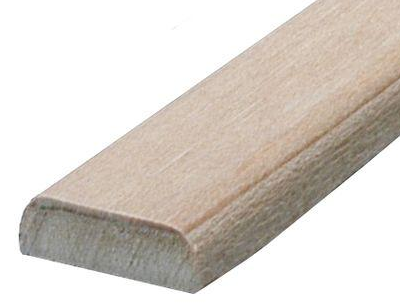 I like to place a large silpat on the counter, then place two pieces of screen moulding (cut into two 24″ strips) down, about the width of my rolling pin, then place about half of one disk of dough in between. The screen moulding is a perfect tool since they’re flat on the top and you can rest the rolling pin on them (vs using a round dowel). Top the dough with a piece of parchment paper and flatten a bit with your hands. Then roll out the dough, using the moulding to keep the thickness consistent. Before using a cookie cutter, dip it in some flour, knocking excess off. To lift the cookie off the parchment paper and place on the baking tray, dip a small spatula in flour, again knocking off the excess, then use the lightly floured spatula to move the cookie. This year (2018) I had picked up some cookie stamps and embossed rollers. I used the roller on my shortbread cookies, and used the snowflake stamp on the gingerbread. When using the stamp, make sure that the dough isn’t super cold, though chilling the stamp itself is a good idea. I also followed the same idea as my cookie cutters and dipped the stamp in flour, banging off as much excess as I could before pressing into the dough. I used a thin glaze, as well, for the snowflake cookies, it took a few cookies to get it to the right consistency, but I liked how it filled the impressions. I also cheated this year and bought icing pouches. They worked perfectly, albeit I couldn’t get a lot of detail from it, but it was way easier than trying to get the royal icing right. Sift the dry ingredients in a bowl and whisk to blend. Cream butter and sugar together until light and fluffy, about 3 minutes. Beat in egg and molasses and mix until smooth. Gradually add the dry ingredients, while mixing on low, and mix until the dough comes together. Turn out onto a floured surface and knead the dough a couple of times until it becomes smooth. Divide in two and form into disks. Wrap in plastic and chill for at least 3 hours, or overnight. Roll the dough out on to about 1/4 inch thickness. Cut out your cookies and place on a parchment or silpat lined baking sheet. Bake for 10 minutes, (rotating the tray halfway through if your oven cooks unevenly). Let the cookies cool on the baking sheet for a few minutes before moving them to a cooling rack. To make the royal icing, put the egg white powder and water in the bowl of a stand mixer fitted with the whisk attachment. Then add the sifted sugar gradually and beat until the frosting is spreadable and glossy. If the frosting gets too thick you can add a bit of cream, milk, or water to thin. Keep adding water until it flows smoothly, yet still thick, off the whisk. Spoon some of the frosting into a squeeze bottle, pastry bag, or baggie if you would like to pipe it around the outline of each cookie. Then roughly fill in the lines, spreading the icing out with a toothpick or the tip of a butterknife. Decorate your cookies with sprinkles, etc, while the icing is still wet. It will harden as it dries. You can easily freeze royal icing, putting into an airtight container. Bring to room temperature and rewhip if necessary. You did a fabulous job with these cookies, it makes we want to make them all over again, or at least take a big bite out of one of yours 🙂 Thanks for the shout out!